I'm currently on a trip to The States, visiting my sister's family in Washington State, and later my folks in Ohio. I took the opportunity of being here to give shoe retailer Zappos.com a try. My feet are water-ski narrow (US size 13½ width AA), a size that shoes simply aren't made for, but some makers do offer a “N” (narrow) or even “B” (super narrow) sizes, which is at least a step in the right direction to the “AA” (ultra-crazy narrow) width I really need. So, prior to my trip, I searched Zappo's huge inventory for size 13½ or 14 in the various narrow widths, and placed my order for lots of shoes to try, so that by the time I got here, dozen pairs of shoes, socks, and shoe inserts waiting for me. Zappo's thing is that they pay for shipping both to you, and if you decide you don't want something, for the return as well, so this kind of “order a bunch to try and keep only a few” thing is exactly their business model. 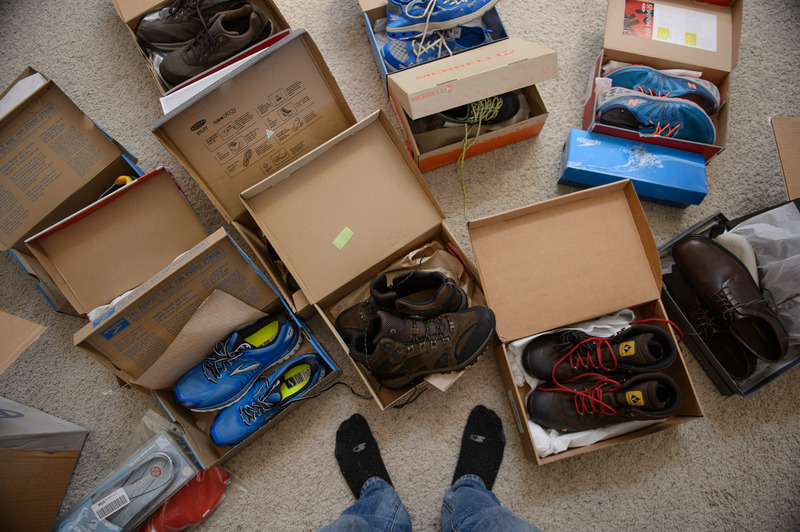 So it was fun to go through the various pairs of gym shoes, running shoes, hiking shoes, and dress shoes. For sports stuff, I found time and again that Brooks brand just fit me the best, so I've a new favorite there. For other brands, I generally had to replace the insole with a special narrow arch-support insole; in addition to extreme narrowness, my feet have absolutely no arch. These insoles are more than $40 for a pair, but they make the difference between comfort and pain. I kept a bunch and sent back the rest, then promptly ordered more when I realized that the running shoes I kept were not appropriate for side-to-side movement of playing soccer with Anthony. UPS says that order is “out for delivery”, so four pairs should be arriving today, with three going back tomorrow. The problem with this business model is that it works so well, and I find myself scouring Zappos.com for interesting styles that I've seen out on the street. But I'm limited by luggage weight and space (and then storage space at home in lack-of-space Japan), so I must show restraint. If you don’t mind, could you say what those inserts are? I also have flat feet and have tried some in the past with only mild success. Regarding shoes and arch-support insoles I must recommend you try barefoot shoes. I have low arches in my feet and previously when I was shopping for shoes, I always looked for shoes with some kind of arch-support. Then a few years ago I stumbled upon insoles that were done in-shop based on metering my feet (so custom made for me) and I liked those better. But I’d been reading about barefoot shoes and wanted to try them, but I wasn’t sure if they would suit me because they didn’t have arch-support. A while ago I talked with a representative and she said that they would suit me because walking barefoot strengthens feet muscles and improves gait. Later when googling I found out that arch-support makes your feet “lazy” and shock absorbing makes you walk in unnatural way. So I bought one pair of Vivo Barefoot shoes for casual every day use and couldn’t be happier. It takes a while to get used to them, but after a week or two they feel amazing. Different kinds of surfaces have a very different feel and for example cobblestone roads feel like a bit foot massage. I was on a week long trip few weeks ago and although we were walking a lot each day I never had any feet aches that I’d normally have after a long day’s walk. My shoes are mainly for city use on hard surfaces, but I’m already thinking about replacing my sneakers with barefoot shoes meant for running/trekking. Bigger shoe makers (Nike etc) seem to be moving to this direction as well with barefoot-like feel. You’re getting free shipping. They’re getting free advertising. I’ve heard of Zappos but didn’t know about the shipping. And the fact they turned down your offer to pay for shipping makes me even more interested in them. I’ll have to check them out! Just a quick note, Zappos is owned by Amazon. I wish Amazon would take over the government and show them how to make things work! Viva la Amazon! Viva la Zappos! I’ve used Zappos for years, love them and their return policy (I have hard-to-fit feet as well). One thing (maybe too late for this trip) you may want to inquire about, the last time I ordered they gave me VIP status/account which is free next-business-day/overnight shipping for all transactions. (No fees, or anything, just a perk they gave for some reason — I don’t order a lot of shoes/year so it can’t be based on purchasing volume). I feel your pain. Firmly held to earth by 14 4E shoes I live in fear that my footwear will be damaged while traveling. Once when I was looking for Mephistos in Rome, I was at probably the 4th store that did not have my size I asked if there was anyplace they would recommend. They said “yes, try the UK or Germany” So it goes. Burlington Ontario December 17/13 at 23:24 local time. Footwear any size can be a pain (in the foot). Over the last year have lost considerable weight (Gerson modified diet as well eating smaller portions) I started at 460 pounds and a physical height of six foot 8 inches. And now am down to about 410 pounds over 12 months. However my footwear has always been custom made. the shoes are still the same length however the width is down to from 9E to 4 E.
It was easier to order a new pair of shsoes for C$1100.00 which I shall collect the third week of January for inital fitting. Feet have three pair of woolly socks on them (it is winter here) as well as elastic socks underneath for leg support. Trust me Jeffrey at some point in your life you’ll want and appreciate the support. And the other reason for newer footwear am back keyboarding on a two year old Roland piano with auxiliary speakers. Feel its time after a layoff of at least ten years. And I enjoy music and the playing of same. One friend who knows me well has suggested once I get back my overall strength after weight loss and the cancer effects of six years ago maybe get back to playing pipe organ which I really enjoyed. One may only hope.